Chignecto Central Regional Centre for Education’s website address has changed to reflect our new name. As of June 27th, 2018, you can now find our website at www.ccrcens.ca. 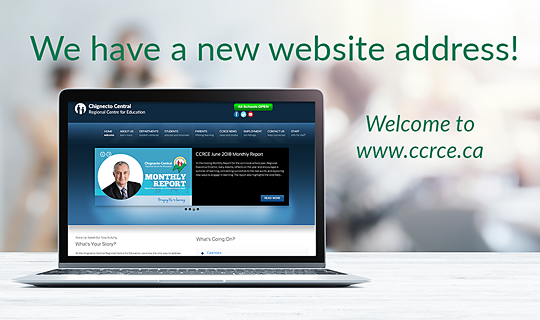 We understand it takes time to get used to change—we will redirect www.ccrsb.ca to our new www.ccrcens.ca website address for the next year. Don’t forget to update your bookmarks! Reminder that our social media account names have also changed! If you follow us on Twitter, you don’t need to do a thing—just be sure to tag us with our new handle, @CCRCE_NS, to let us know what’s happening in your school community!